After selling their Nob Hill Foods supermarkets, Gilroy Gardens was created and built by Michael and Claudia Bonfante and is designed to educate guests and to foster a greater appreciation of horticulture. 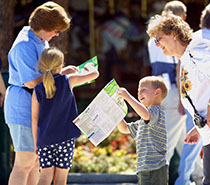 The park features over forty rides, attractions, educational exhibits and majestic gardens. It was originally known as Bonfante Gardens Theme Park and below is how the its journey unfolded. • Michael Bonfante comes from a family with a history of ground-breaking ideas. In 1944 Michael’s father, Mike Bonfante, built the first American hotel in Acapulco, Mexico and in 1957 Michael’s uncle John Bonfante built the first fly-in resort in Baja California. Michael proudly refers to the spirit of risk-taking as “The Bonfante Genetic Flaw”. • Michael began to expand his role in the family supermarket business. During the early years, he found the prescription for high-stress management life to be the calming nature of trees. And thus, Michael began his long-time love affair with our leafy friends. • Michael decided that the best way to satisfy his deep desire to own “big trees” was to start a business selling them. Due to water issues, Tree Haven was moved twice before landing in its final location, now the home of Gilroy Gardens. During this time, he began to ponder the idea of a park that would inspire young people to appreciate the beauty of trees. • Michael opened Nob Hill Family Park—the home to all of his botanical wonders and a recreational facility for his employees. This helped resolve his desire to create a venue that would support his “tree habit” while also providing a truly wonderful facility for his staff. • Michael set out on a journey to learn more about horticultural facilities while he considered whether he could open a public “tree themed” garden. “I learn by doing and talking, not be reading,” says Michael. He traveled the globe touring theme parks and public gardens and learning all he could about building his dream. Unfortunately, Michael could never get the “numbers” to pencil out. “Finally, we learned the only way a garden could be naturally beautiful and still economically viable was to add rides,” says Michael. • During this time, Michael’s attention was caught by the story of ailing “Circus Trees” in nearby Scotts Valley. The trees planted by Axel Erlandson featured magically complex designs. Erlandson grafted over 70 “wooden wonders.” After his death in 1964 the trees were left to the elements until Mark Primack led a valiant effort to save them. Yet, only 31 trees survived. Michael bought the Circus Trees and brought them to Gilroy. He purchased surrounding land and expanded the facility, which is currently 536 acres. Trees were imported from as far away as Holland and Italy and rocks from as far as Idaho and Montana. The tapestry of Michael’s vision began to take shape. 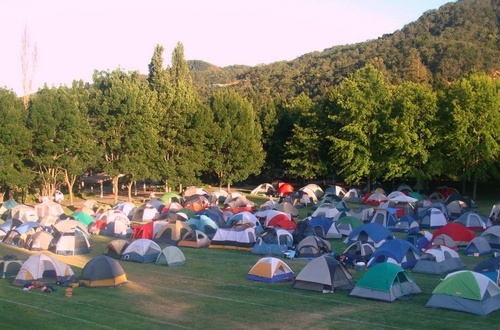 • Nob Hill Family Park became Hecker Pass…A Family Adventure. Michael decided if his Nob Hill Foods employees loved the picnic park then he chould offer it to other companies to enjoy. Hecker Pass…A Family Adventure operated through 2000 while the theme park was under construction. Many elements in the original picnic park that eventually ended up in the theme park included some of the small children's rides. • Michael had grown Nob Hill Foods to 27 stores and 2500 employees. As Nob Hill Foods grew, so did the vision of Gilroy Gardens. Simultaneously, the cost of the dream began to escalate and Michael had to make tough choices. He couldn’t afford to run his stores while building Gilroy Gardens and made the decision to sell the stores. The proceeds were placed in a community trust, ensuring the park would open. • The word "Family" was added to the park's name; changing it to Bonfante Gardens Family Theme Park. • Bonfante Gardens hires Paramount Parks, Inc. to manage the park's operations and provide strategic guidance on financial decisions and long-range planning. • Bonfante's Wild Bird Adventure™ and Wild Wings™ open as temporary single year attractions. • The first Bonfante Gardens Holiday Lights™ special event opens to the public, giving guests 12 beautiful nights of holiday fun! 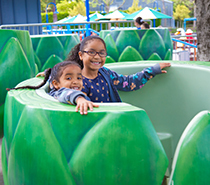 • Bonfante's Splash Garden™ opens as Bonfante Gardens' first permanently installed attraction since its opening, featuring five new interactive water attractions. 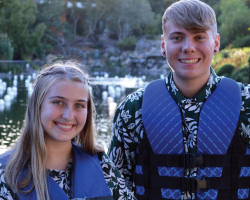 • Bonfante Gardens begins 7th Season with new name—Gilroy Gardens Family Theme Park—to help the park better identify with the location, and a new mascot, Gil the Garlic Guy. • Pit Stop Racer and Big Red Engine Co. kiddie rides return after a four year absence. • Gilroy Gardens Family Theme Park celebrates the holidays with its 6th Annual Holiday Lights™ and an exciting new feature! Nights of Fire: Laser Light & Fireworks Spectacular...15 minutes of lasers, lights and fireworks all dancing to the beat of a scintillating holiday soundtrack! 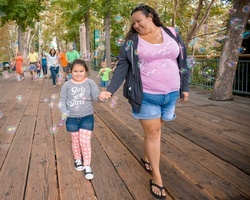 • 2010 brings in Gilroy Gardens' 10th anniversary by celebrating 10 Years of Wonder! • Gilroy Gardens introduces a new mascot. Gil's kid sister, Roy. "GILbert introduces ROYelle...a little bit princess; a little bit tomboy...and she likes to be called Roy!" • Lumination: Chinese Culture Celebrated in a Whole New Light ran through January 2017. This event was a spectacular festival of light celebrating 2,000 years of Chinese culture and tradition. It showcased over 30 intricately made, colossal light displays that were fascinating by day and absolutely breathtaking at night. Each lantern was handmade by artisans from Zigong, China. Gilroy Gardens launched an all-new event called Gardens@Night. The separately themed night-time event ran October through December 2017. The festivities began October 1st with Halloween@Night and included trick 'r treating for the kids, themed food, special spooky activities, and more, ending on October 29th. Harvest@Night ran November 3-26 and included local beer and wine tasting, specially created food and live bands playing each weekend. December 1-30 saw the return of our signature holiday event, now called Holiday@Night. Special treats, the Holiday Feast and more returned to close out our season.